In September 1994 an outbreak of acute respiratory disease occurred in a stable in the Brisbane suburb of Hendra. Twenty one horses became infected, 13 of them fatally. Alarmingly, the disease also spread to two people and one of them, the well known racehorse trainer Vic Rail, died following a severe influenza-like illness. The novel symptoms and rapid spread of the disease and its appearance in both horses and man brought together teams of scientists and veterinarians at the CSIRO Australian Animal Health Laboratory and the Queensland Department of Primary Industry. All known exotic infectious diseases, such as African horse sickness, were excluded by tests at AAHL and within a month a new virus was isolated and diagnostic procedures to identify it were established. The virus was initially called equine morbillivirus, but later renamed Hendra virus after the suburb where the outbreak occurred. Since the first outbreak there have been 12 clusters of Hendra virus infection recorded in horses with seven people infected four of whom have died. A subsequent lethal outbreak at Mackay in Queensland revealed that the virus was able to cause both respiratory and encephalitic disease. A search for the animal reservoir host for this newly described disease revealed that all four species of flying fox found in Australia could harbour the virus without ill effect. In 1998-99 a second more dangerous paramyxovirus relative, called Nipah virus, was discovered following an outbreak of respiratory disease in the pig population of Malaysia in 1998-99. It was accompanied by clusters of cases of encephalitis among pig farmers. Further outbreaks of Nipah encephalitis have occurred in Bangladesh and India with case fatality rates approaching 70%. The wild life reservoir of Nipah virus, like that of Hendra virus, is a species of flying fox found in South East Asia. For their work on the discovery and characterisation of the Hendra virus, the CSIRO team, led by Keith Murray, were awarded the CSIRO Chairman’s Medal in 1995. Ten days before the explosive outbreak at Hendra, Brisbane in late September 1994, a pregnant mare had been transported to the Hendra stables from a paddock where racehorses were pastured for a rest period. This horse developed severe respiratory symptoms and died within a day of arrival at the stable. This is considered to be the first case of the outbreak although diagnostic evidence for this supposition is lacking because no tissue samples from that horse are available. Shortly thereafter other horses at the stable became very ill, some displaying a frothy nasal discharge at death. Of the remaining 12 horses that died, one was from a neighbouring property but had close contact with the stabled horses, one had been transported during the incubation period to a distant property and the remaining 10 were located in the stable. The 49 years old trainer of the horses, Vic Rail, and a 40 years old stable hand who had had close contact with the dying mare also became ill with a severe influenza-like illness. The stable hand recovered, but the trainer, Vic Rail, died after 6 days of intensive care and was found on post mortem to have had severe interstitial pneumonia. Although Vic Rail had a prior history of Ross River virus and hepatitis A virus infections, he was well immediately before this illness. The localized nature of the outbreak was confirmed when widespread surveillance testing of other horses in Queensland revealed no evidence of Hendra virus infection. The clinical signs in horses at the Hendra stable suggested to veterinary authorities that the virus responsible might be the exotic, African horse sickness virus. Consequently samples taken from two of the infected horses were sent immediately to AAHL and submitted to the diagnostic team there as a ‘Category III Alert’. This is the highest level of vigilance and it ensured that a multidisciplinary team of experts at AAHL stopped what they were doing and committed themselves to the identification of any virus in the submitted samples. Given the likelihood that the infection was caused by a virus, homogenates (clarified ground-up suspensions) of lung and spleen samples from two of the infected horses were inoculated into two recipient horses intravenously as well as by intranasal aerosol. After inoculation the two horses showed little signs of infection for 6-10 days respectively, before developing an acute disease of 2 days duration with high fever and signs of respiratory distress. Virologists also added portions of the homogenates of the submitted diagnostic samples to cultured cells in the hope that any virus in the samples would be amplified. Within 3 days after inoculation, the cell cultures showed cytopathic effects with focal syncytia formation, which subsequently spread throughout the entire cell monolayer. Syncitia formation in cell culture is characteristic of a number of viruses including morbilliviruses. The hunt for the culprit expanded. Electron microscopists and histologists examined tissues looking for virus or evidence of disease. When it was observed that ‘something’ was growing in cells in culture (syncitia formation), serologists used antibodies to a wide range of viruses in an attempt to identify the specific virus that was replicating. The electron microscopists obtained images of the virus both inside and released from cells and molecular biologists started the work of sequencing the genetic material of the virus. Within a few weeks a virus was isolated and although it could be positively identified in the electron microscope as a member of a family of viruses called paramyxoviruses, the virus did not react with antibodies to other members of the family such as measles, mumps, canine distemper and rinderpest viruses. However gene sequencing did confirm a distant relationship with the paramyxoviruses. 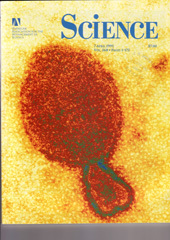 The paper describing the isolation and preliminary characterisation of the virus was published in 1995 in the 7 April issue of the prestigious international journal Science, with the electron microscope image of the virus on its cover. Another outbreak of Hendra virus infection came to light in October 1995 when Hendra virus was detected in a farmer from Mackay, Queensland, some 600 miles north of Hendra. The farmer had been hospitalized with an undiagnosed encephalitic illness. Further investigations revealed that 13 months before his terminal illness (and a month after the first outbreak at Hendra) the farmer had assisted at the necropsy of two horses that had died on his property. Analysis of tissue samples from the horses retrospectively confirmed that they had been infected with Hendra virus. A similar pattern of transmission from horse to man was responsible for the deaths of two Queensland veterinarians, in 2008 and 2009. The occurrence of outbreaks at Hendra and Mackay occurred within a month of each other and it was concluded that the source of the virus (the so-called reservoir host) would either be capable of migrating the 600 miles between the two sites or be present at both sites. From lists of known species of mammals, birds, reptiles and amphibians in both areas, fruit bats and wading birds were selected as the most likely candidates. The team from the Queensland Department of Primary Industry took blood samples from flying foxes and showed that all four species of flying fox found in Australia had antibody to the virus implying previous infection. However no evidence was found for disease in flying foxes caused by Hendra virus. In 2000 Hendra virus itself was isolated from two species of flying fox. Later work using experimentally infected flying foxes confirmed the absence of any clinical symptoms following infection with doses of virus that would be lethal for horses. Indeed some flying foxes shrugged off the infection without generating any detectable antibody. These data are consistent with flying foxes being the natural host or reservoir of Hendra virus. How unique is Hendra virus? Investigators at AAHL have confirmed that Hendra virus has a number of distinctive characteristics. First, the nucleic acid sequence of the Hendra virus genome is only distantly related to other paramyxoviruses, but the virus genes are organised in a manner that resembles the other viruses in this family. Second, Hendra virus causes the formation of unique giant cells in the lining of the blood vessels of infected animals. Third, unlike other paramyxoviruses, Hendra virus is able to infect a variety of other animal species. In addition to horses, humans and bats: cats and guinea pigs are highly susceptible. Finally, the clinical symptoms observed in those infected at Hendra and Mackay reveal that the virus is able to cause both respiratory and encephalitic disease. In 1998 and 1999 an outbreak of respiratory disease spread among the pig population of Malaysia. It was accompanied by clusters of cases of encephalitis among pig farmers. Over one million pigs were destroyed to halt the epidemic and by mid 1999, 265 human cases of acute encephalitis were recorded including a cluster among abattoir workers in Singapore. The tests developed for Hendra virus at AAHL were instrumental in the rapid identification of a previously unknown and closely related virus now called Nipah virus. The wild life reservoir of Nipah virus, like that of Hendra virus, is a species of flying fox found in South East Asia. The distinctive nature of Hendra and Nipah viruses led scientists at AAHL to create a new genus to accommodate classification of both viruses within the paramyxovirus family. The name chosen for the genus was Henipavirus, a name now internationally accepted. Further outbreaks of Nipah encephalitis have occurred in Bangladesh and India with case fatality rates approaching 70%. The highly virulent nature of Hendra and Nipah viruses has lead to their classification as biohazard level 4 agents and as such they can only be worked on by scientists and veterinarians at AAHL wearing space suits that are individually supplied with air. Flying foxes are distributed from Madagascar through the Indian subcontinent to south-eastern Asia and Australia and as far east as the Cook Islands. Serological studies now suggest that Henipaviruses will be detected wherever flying foxes are to be found. Their wide spread distribution and the continuing re-emergence of highly pathogenic Henipaviruses highlight the need not only for diagnostic procedures to rapidly detect the viruses and their variants, but also for therapeutic procedures for human application in outbreak areas. To that end a number of studies have shown that passive transfer of antibodies that can bind to either of the two proteins (the attachment protein and the fusion protein) on the surface of the virus protects animals against a lethal challenge. Human monoclonal antibodies have also been shown to neutralise both Hendra and Nipah viruses. In addition, it has been shown that peptides that mimic portions of the virus fusion protein block virus infection and that subunit vaccines containing the virus attachment protein elicit a protective immune response. Scientists are continuing to meet the challenge presented by these novel viruses. Eaton B, 2009, Personal communication. Murray K et al., 1995, ‘A morbillivirus that caused fatal disease in horses and humans’, Science, 268: 94-97.